Bhubaneswar,Odisha has advertised for the recruitment of Teaching Faculty- Professor,Associate,Assistant Professor jobs vacancies. Interested and eligible job aspirants are requested to apply with in 7 days. Check out further more details below. 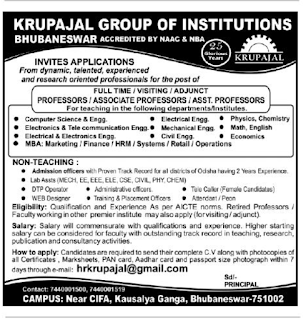 Name of the College: Krupajal Group of Institutions,Bhubaneswar,Odisha. About College: Globalization & knowledge explosion are the major features of present days civilization. This has been manifested in creating new dimension in the realms of science, technology, IT and management. Krupajal Group of Institutions was founded in the year 1995 as a missionary institution to provide myriad professional education, so as to produce graduates, who can face the challenges of this fast changing world. Ever since the establishment of its first institute i.e. Orissa Computer Academy, Krupajal Group of Institutions has grown from strength to strength, establishing top of the line educational institutes in various discipline. The empire, Krupajal Group was founded by a great futurist, Dr. B.C. Rath who by all means gave it a colossal shape. 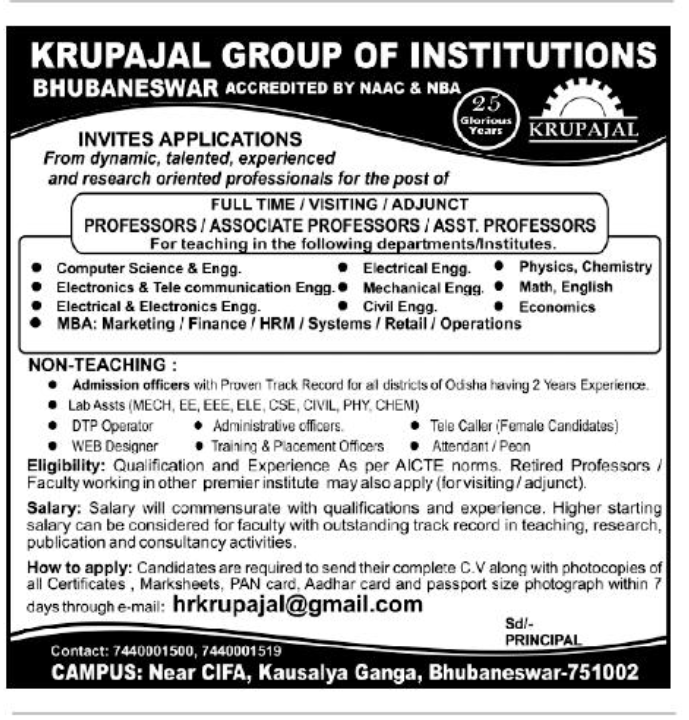 Evolved as a premier group of institutions, Krupajal Group has earned unparalleled popularity in the educational fraternity of Orissa. Having gigantic separate campuses for different programmes, all the institutes under this group are situated at the outskirt of Bhubaneswar. The calm and pollution free surroundings dissolved in chill breeze make the climate salubrious and atmosphere conductive for undisturbed and effective learning. Qualifications and experience as per AICTE norms. How to Apply: Interested and Eligible candidates required to send their resume along with photocopies of all certificates,marksheets,pan card,aadhar card and passport size photo with in 7 days through email.